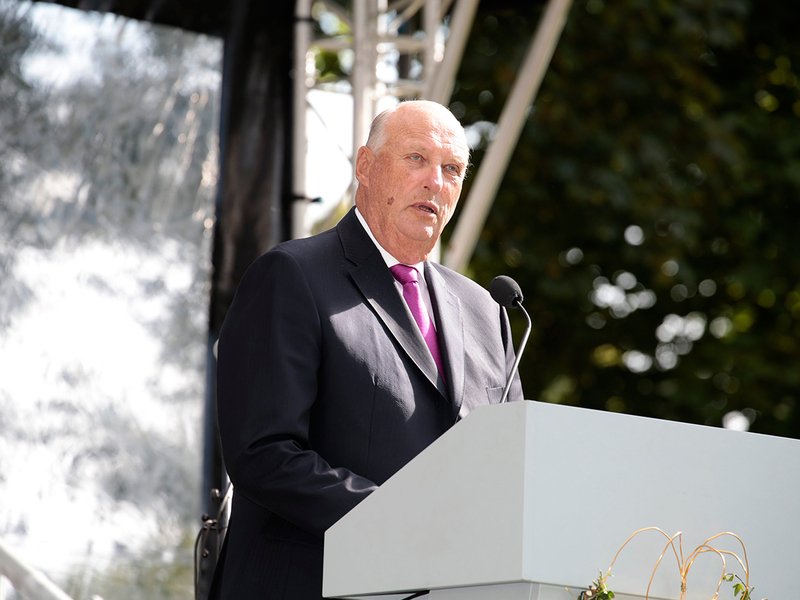 Speech given by His Majesty The King at the garden party hosted by Their Majesties The King and Queen at the Palace Park on 1 September 2016. Translated from Norwegian. After travelling throughout the country over the course of many years, it is a great pleasure for us to host representatives from all of Norway. A warm welcome to every one of you! Those of you who are gathered here represent Norway as it is today. Norway is high mountains and deep fjords. It is wide open spaces and rocky coastlines. It is islands and archipelagos. It is lush farmland and rolling moors. The sea laps Norway’s shores in the north, west and south. Norway is midnight sun and polar night. It is harsh winters and mild winters. It is hot summers and cold summers. Norway is a long and sparsely populated country. But above all, Norway is its people. Norwegians come from North Norway, Central Norway, Southern Norway – and all of the other regions. Norwegians have immigrated from Afghanistan, Pakistan and Poland, from Sweden, Somalia and Syria. My grandparents came here from Denmark and England 110 years ago. It is not always easy to say where we are from, what nationality we are. Home is where our heart is – and that cannot always be confined within national borders. Norwegians are young and old, tall and short, able-bodied and wheelchair users. More and more people are over 100 years old. Norwegians are rich, poor and in-between. Norwegians like football and handball, mountain climbing and sailing – while others prefer lounging on the sofa. Some are self-confident, while others struggle to believe they are good enough as they are. Norwegians work in shops, in hospitals, on offshore platforms. Norwegians work to keep us safe and secure, to keep our country free of pollution and to find new solutions for a green future. Norwegians farm the land and catch fish. Norwegians do research and teach. Norwegians are enthusiastic young people - and wise old people. Norwegians are single, divorced, families with children, and old married couples. Norwegians are girls who love girls, boys who love boys, and girls and boys who love each other. Norwegians believe in God, Allah, the Universe and nothing. Norwegians like Grieg and Kygo, the Hellbillies and Kari Bremnes. In other words: Norway is you. When we sing “Ja, vi elsker dette landet” (‘Yes, we love this country’), we should remember that we are also singing about each other. Because we are this country. Thus, our national anthem is also a declaration of love for the Norwegian people. My greatest hope for Norway is that we will be able to take care of one another. That we will continue to build this country – on a foundation of trust, fellowship and generosity of spirit. That we will feel that we are – despite our differences – one people. Once again, a warm welcome to you all! I hope we will have an enjoyable time together.